Lampre-Merida rider Diego Ulissi, who won two stages at this year's Giro d'Italia, has failed a drugs test taken during the race. 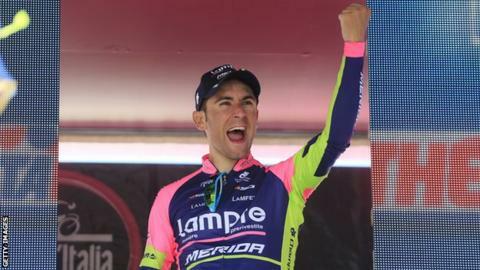 The 24-year-old Italian tested positive for an "abnormal" amount of salbutamol, a drug used for breathing disorders such as asthma. Ulissi had declared and been permitted to use Ventolin, which contains salbutamol, Lampre-Merida stated. He has been suspended by his team pending the analysis of his B sample. "Ulissi strongly rejects the presence of such a large amount of salbutamol," the team said in a statement. Riders are permitted to use the drug for medical purposes below a certain threshold, but Ulissi's "adverse" sample contained almost twice the permitted concentration. The statement continued: "The results of the test from the UCI report the presence in the urine of the athlete of an abnormal amount of salbutamol (1900 ng/ml), higher than the limit allowed by the regulations, which sees the limit at 1000 ng/ml. "The athlete himself and the medical staff of the team will continue to explore the reasons why the urine has been identified as having an abnormal and high presence of salbutamol, compared to only two inhalations performed." Ulissi won stages five and eight of last month's Giro d'Italia, and finished second in an individual time-trial on stage 12, in a race won by Colombia's Nairo Quintana, but he later withdrew from the race with a sore throat and fever. The positive sample was taken after the 11th stage of the Giro on 21 May.